Before discussing or using a CNC router it is helpful to know how to use a handheld router. Your typical router has a motor (possibly a variable speed motor), height adjustment (either fixed, or plunge), and a collet, which is a tapered spring that when compressed creates the friction necessary to hold your cutting tool in place. When you use a noncomputerized router you see, hear, and feel how the tool can cut with instant haptic feedback. If you have access to one, go play with it before attempting to create toolpaths on the computer. Make a quick sketch on a 12”x12” piece of scrap plywood and use a ¼-inch bit to cut it out. If you are working with a fixed base (not a plunge router) be sure to drill a 3/8-inch hole to enable you to safely start the router in the material. Set the bit so that it cuts no more than 1/8 of an inch deep per pass, and be sure to secure the plywood to your table. Be advised that using a router bit/depth not specified could be potentially dangerous. Use a bit smaller than 3/8 inch and use a step of less than the radius of the bit. Begin the cut at the center of your shape and work out in a spiral-like pattern, this will provide support for your router if your shape is larger than its base. As you work your way toward the sketched lines, try making both clockwise and counterclockwise motions and notice that one direction provides far more control and accuracy. A toolpath is the user-defined coded route which a cutting tool follows to machine a part. They are represented on the screen by lines and curves which represent the path of the bottom center of the cutting tool. Pocket toolpaths etch the surface of the material, while profile toolpaths cut all the way through. The process described in the handheld example above is called a “pocket” toolpath. In your first pass you will remove everything inside your lines to a constant depth of 1/8 inch below the surface. If you want to remove more than 1/8 of an inch simply pause after the first pass, lower the bit, and remove a second pass 1/8 of an inch lower and so on. The red lines are “pen up” travel lines, where the router lifts the cutter and travels above the surface of the material to get to the next cut point. The blue shaded area indicates where material will be removed. If you were to want to cut out your shape instead of removing material inside the lines, the toolpath to use would be called a profile (or contour). Most CAM software provides what seems to be an insane number of controls and options in the toolpath dialogue. Don’t get overwhelmed and take your time to slowly move through each tab in succession being sure you understand all the options. 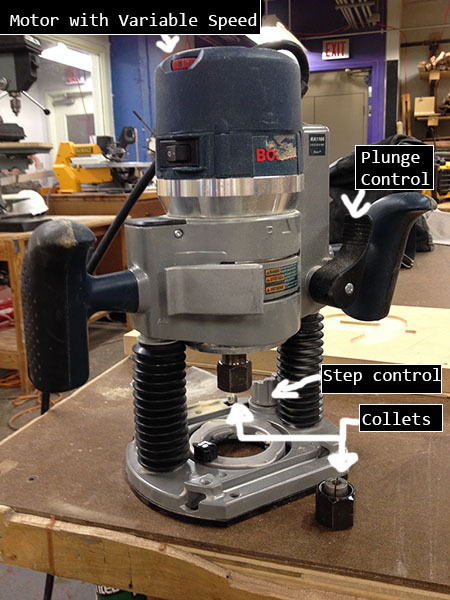 The most important concepts to take away from the handheld router experiment above are: spindle speed, feed rate, step-down, and step-over. We’ll cover these in more detail below. A standard router bit spins clockwise. If this were to follow the left side of the line it would be a climb cut, if it were to follow the right side of the line it would be a conventional cutting motion. In the handheld example above, a clockwise spiral-like pattern from the inside out would also be a conventional cut and will provide more control because we have limited strength when using handheld tools. In fact, many woodworking books refer to this method as the only safe direction to use a router bit. A CNC router however will typically provide a better cut when using a climb cut especially in solid wood because it will eliminate the possibility of tear out along the cutting vector. Starting out, don’t worry too much about this. Generally you should choose the option which includes both such as ‘mixed’ and the software will choose what to use. There are 4 main types of flute patterns for router bits, plus many types of specialty bits. Compression – combination of up and down spiral, great all around bit, great for plywood or laminated sheet goods. Each of these flute patterns has their downfalls. If money isn’t an issue and you are mostly cutting finish grade plywood, I really like the Freud 77-202 or 77-204. Straight flutes are also fantastic, inexpensive and underrated. 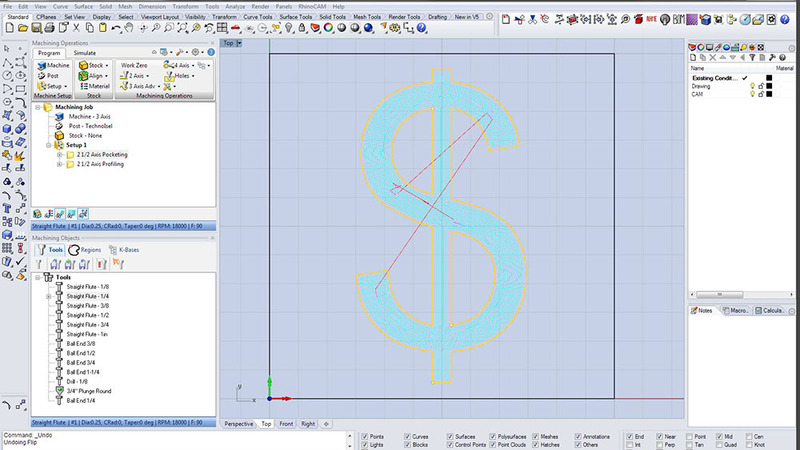 I encourage students to spend time with 2D cuts before using full 3D toolpaths. There are a number of reasons for this, but most importantly taking the time to understand 2D machining allows for a much better understanding of the 3D parameters. I’d be happy to cover 3D in more depth at a later date, but for now I want to discuss containment boundaries. Instead of using wireframe geometry or curves and lines as the primary source of input, a 3D toolpath uses surfaces called ‘drive surfaces.’ In order to achieve the desired outcome it is often necessary to use a containment boundary. This is a curve which defines the limits of motion in x and y on the drive surface. The key to using containment boundaries is that they must be above your geometry. Typically I move the model below to the construction plane before starting and put containment on the CPlane. Most spindles (the term for the router attached to your cnc router) will go from about 7,000rpm to 18,000rpm. This speed is termed ‘spindle speed’ and is directly related to the feed rate or surface speed, which most machines are capable of doing up to about 200ipm. The two other variables, step-down and step-over should be kept so that the cross-sectional area engaged with the material is no more than the radius times the diameter of the bit. This is a rule of thumb, but it’s a good starting point for feed and speed calculations. Where chipload is the amount of material cut per tooth (feed per tooth). Feed rate is the surface speed of the cutting tool in inches per min, spindle speed is the rotational speed of the cutting tool in revolutions per min, number of flutes and cutter diameter are determined by your tool. In this case they are ¼ inch and 2 flutes. Depending on the size of your bit, the chipload for plywood is between 0.005 inches 0.01 inches per tooth. For small bits below 1/8 inch start with 0.005 and increase from it there. For bits 1/4 inch and larger you will probably not break anything starting out at 0.01. The size of the chipload or feed per tooth is a very important factor in machining, larger chips are able to pull away more heat. Smaller chips are easier on your machine and tools but can cause too much heat. You want to make chips that when dropped fall to the floor rather than become dust that stays in the air. When trying to hone in on your feeds and speeds with a new bit, guess as best you can using the feeds and speeds formula and touch the bit as soon as it stops spinning after making a few cuts (remember: safety first), it should be warm, maybe a little hot to the touch, but it should not burn you. If it is too hot, increase the feed rate or lower the spindle speed. Look at the quality of the edge after the cut has been completed. If it is wavy, that’s tool chatter and you should decrease your feed rate or increase your spindle speed. Use your ears too, the tool should sound good when cutting … trust your gut. Keeping in mind that we don’t want to push the bit any faster than roughly 200ipm, if we wanted to use a 1/2 inch 4 flute bit, we could solve for spindle speed rather than feed rate. It’s helpful to make a chart so you can quickly find the numbers you are looking for. You are welcome to use my feeds and speeds chart. All of these numbers are based on a step-down of the radius and step-over of the diameter of the bit. With the chipload set to 0.01 it is possible to step down and over the diameter of the bit, but that is the absolute maximum and should only be brief moments in the cut. It’s possible to damage your spindle by pushing it too hard, remember to always warm up the spindle for at least 10 minutes before making any cuts. There are some expensive bearings in there that will be destroyed if you skip this step. When profile cutting veneered plywood I like to use a compression bit with a technique called onion skinning. There are many different ways to program any job, but this method is a catchall for small parts and a good finished edge with no tear out on a vacuum table with a spoilboard. The idea is to step down by level first, so cut all your parts down to the first step, then to the second step and so on, leaving a thin layer of veneer at the bottom of each cut. Then, in a final pass, cut the thin ‘onion skin’ of veneer which is left. Because the amount left is so thin it offers little resistance to the bit and lowers the chance of your part moving. If I were cutting 3/4 in plywood it would actually measure somewhere around 0.72 inches, I would step down twice, 0.34 per pass leaving 0.04 inches plus 0.02 breakthrough for the last toolpath to remove. Because I’m stepping down almost 3/8 of an inch while cutting the full 1/4 inch width of the bit in each pass, I would have to lower the feed rate. With a 1/4 inch bit I should be stepping down 1/8 of an inch (the radius) when making contour cut using a chipload of 0.01 inches. But I want to use a compression bit to avoid any tear out on the top of my sheet and that bit doesn’t have a down spiral until about 5/16 of an inch up the cutting edge. So I have to step down 3/8 of an inch. Because I’m increasing the cross-sectional area of the bit engaged with the material, I should decrease the chipload by the same amount so the new chipload would be 0.00333 and return a new feed rate of 30ipm. After a bit of experimentation I have found that a chipload of 0.005inches at 18000rpm resulting in a feed rate of 45ipm is optimal for my needs. Don’t get too carried away with the numbers, use your common sense and trust your gut. Every bit is a little different and there is a wide range of densities in solid wood and different sheet goods. Also, always wear your safety glasses. It seems like an overly cautious measure many times, but consider the likely scenario of a small 1/8 inch carbide bit shattering. It’s not likely that wood dust will put you in the hospital, but a small shard of steel in your eye is something to reckon with. If you are interested it is possible to download a free trial of Rhino for 90 days. You can also download RhinoCAM from MecSoft. It will not allow you to save your files, but you can experiment and learn for free.